You can get there from here. I’m speak­ing of the future, which many man­agers and lead­ers I meet seem to con­sid­er far more of a threat than an oppor­tu­ni­ty. There’s a rea­son for that. Any ath­lete, artist, health provider, politi­cian or sci­en­tist who — when about to per­form — quakes with fear if he or she has not pre­pared for the moment. Dit­to the per­son in busi­ness who sens­es the need for change in the future but isn’t pre­pared to meet the chal­lenge of that change. That’s why, when I was giv­en the chance to write a blog post for the pres­ti­gious Peter Druck­er Soci­ety Europe [link], I chose to focus on the capa­bil­i­ties that every­one will need in a lead­er­ship posi­tion tomor­row. To my mind, there are four key skills that you, per­son­al­ly, will need to devel­op in order to be able to lead your enter­prise in the com­ing years. But I had help in iden­ti­fy­ing these skills. I invite you now to jump to the Druck­er Soci­ety Europe blog to read my post, “Time to Clean the Man­age­ment Lens” [link]. As always, I would love to hear your thoughts about the absolute­ly essen­tial skills that you believe will be need­ed in the years ahead, and I hope you will share your com­ments here. 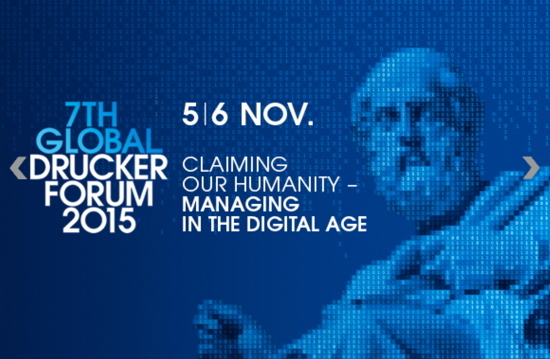 And I hope you will join me 5 – 6 Novem­ber 2015 for the Druck­er Forum meet­ings in Vien­na. The theme is “Claim­ing Our Human­i­ty: Man­ag­ing in the Dig­i­tal Age” [link]. With­out doubt, the quick­en­ing pace and enor­mous impact of tech­no­log­i­cal change is at the heart of many fears about man­ag­ing the future. What’s key to stress is this: if you are feel­ing either slight­ly intim­i­dat­ed or all-out ter­ri­fied about the future, I assure you — you are not alone. What will sep­a­rate future top per­form­ers from the man­age­ri­al­ly impar­ied is how well they pre­pare today.